I have a United puck bowler (Astro) that I am having an issue with. Pin #8 will retract automatically when you start a game. It will retract and the trip bank switches activate and the game will resister the #8 pin. I think the sequence of events is this: puck rolls over the playfield switches, the switches close which activates the pin relay which retracts the pin, then the trip bank switches are pulled in by the contacts in the pin relay. I'm thinking that I have a lane switch permanently closed under the alley which is causing the #8 pin to retract by itself? I looked at every lane switch and could not find any that were permanently closed. 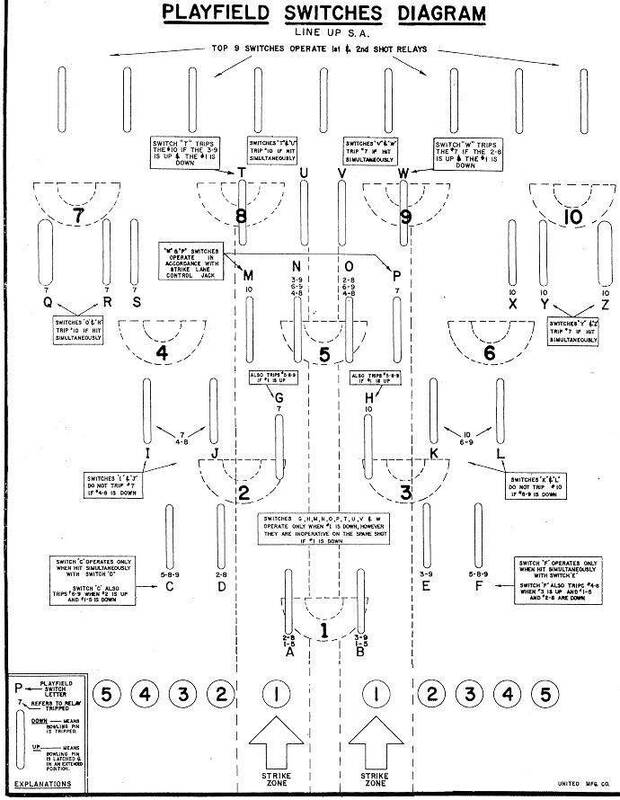 Is there any way I can find out exactly what lane switch controls pin #8? Yes, with the game in game over mode, I cycled the motor and all the pins reset. Its just when you start a game the #8 pin retracts as soon as its reset. 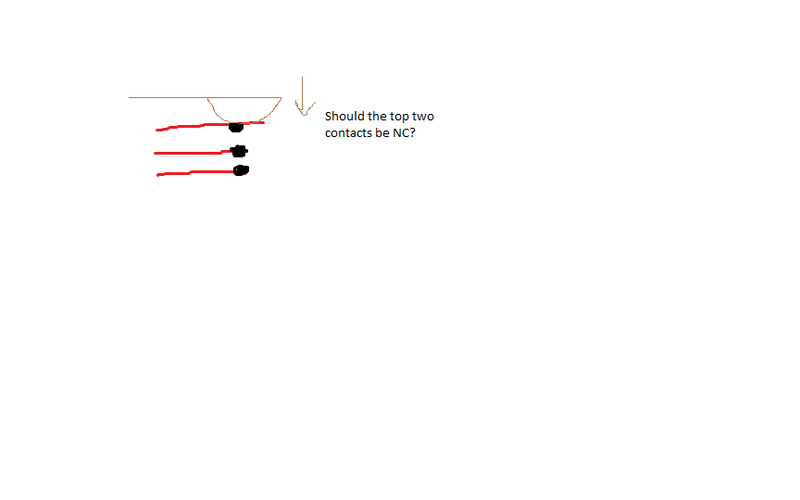 if the drawing is correct( it looks correct) both contacts are normally open. you have to closely look at every lane switch. chech for the little tabs when the wires are soldered being bent and touching too. also, stray wire, screws, washers. the pin lifting doesnt cause the relay bank relay to trip, its the other way around. the relay bank relay trips first. something is tripping the bank in the relay. if you try to reset that one relay manually, does it latch or immediately trip? If I try to reset the trip switches, it will not let me, as in in it will immediately trip again. Does anyone have a United Astro and can take me a picture of the trip bank switch label. My game is missing the paper label. So I did some more tests. I disconnected the under play field switch plug and the trip bank relay doesn't power, so the problem is in the roll over lane switches. One switch is permanently closed or perhaps the switch bank bake light spacers are cracked and shorting against each other. I have seen this happen before and that is how I lost most of my hair. I carefully examined each switch stack three times and I still cant find any switches that are always closed. How can I narrow this down; short of cutting each wire? you are gonna need to do a continuity test on all the lane switches. there are prob two that will trip pin 8.
if you have a bunch of clip leads, you can find the hot or nuetral and connect them, then add one at a time to test/verify each switch. the schematic would help, but those lane switch lines are a bear to follow. Also, thats a multi game bowler. there are step units that may be involved too. I am trying to bring a Williams / United Omni shuffle alley back from the dead, just like this thread since it's relevant and so I didn't have to start a new one. I already had to replace both CPU boards and the display driver board with restored ones. Everything worked great for awhile, probably 1000+ games. But now it's not registering the shots on the pins properly. For example, if you shoot it perfect and it should have been a strike, it's lifting all the pins but not recording a strike (like it missed some). So I have to take another shot to finish the turn. Or if I bowl on the outer edges, sometimes it should just register 2 pins, but all pins lift. Still have to take another shot to finish the turn. Same with other random spots, it seems like more pins are lifting than should be. And sometimes, although less and less frequently, it actually records a strike when it should have been a strike, like it's supposed to. I've checked to ensure no wires / solder connections in the play field rollover switches broke or came loose, I've checked to make sure the leaf switches have what appears to be the correct gap, that the metal guides are coming down far enough to trigger them, and I've gently brushed all the crud out from between the leafs with a wire brush. Also tried checking for continuity but it seems to only work on some of the switches unless I'm not doing something right. 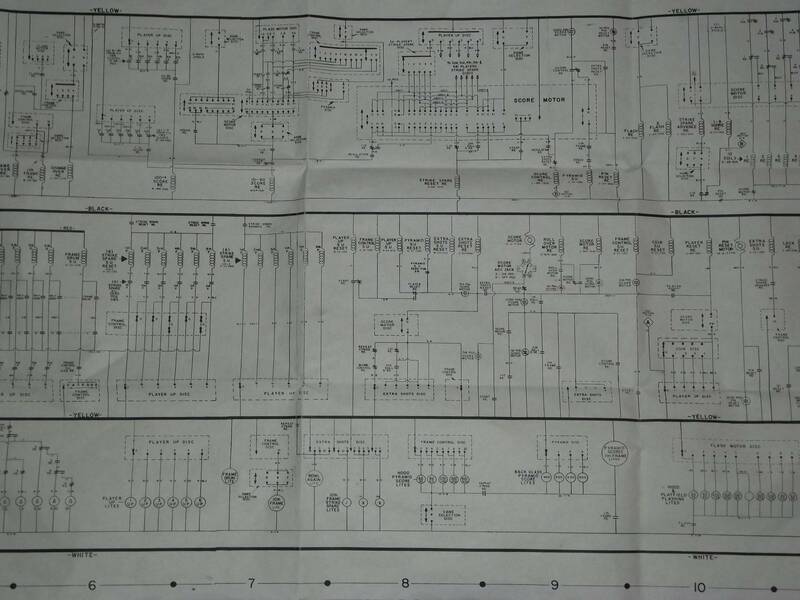 I have no manual, no schematics, and no idea what I'm doing for the most part. I could also use a fresh backglass & the piece that goes on the pin tray as well. Just a followup, I ran through the switch test for all play field rollovers and they all register the appropriate switch number according to the switch matrix, including the ones that require 2 switches to be activated for one #. Also flipped the dip switches & did the CPU test. Put them back to where they were when I was done and now I cannot add credits or start a game and the P6 display flashes while P1-P5 don't. Phew, what an overwhelming amount of responses! I was starting to think I needed to replace the entire game or scrap it. Luckily my local repair tech is reliable & knowledgable. Just in case anyone else has similar issues, there is a tiny board in the back of the cabinet next to the sound board that has a row of 10 diodes on it, the board is maybe 3" x 3". 8 of 10 were blown. Why? I don't know. Apparently some of the pin solenoid wiring & some sound wires pass through there to produce the strike, spare & blow sounds so it didn't have to be coded into the game. And with them blown and shorting, it wasn't lifting the pins properly or getting the scoring right. Back up and running now. I'm having the same issue but with pin #9, the exact mirror of your #8 pin. Did you solve the problem and if so how? I noticed a guy with a modern computer controlled (MPU) bowler sort of jumped in this thread and seemed to kill it! Guess he didn't realize this is an EM (electro-mechanical) machine. 04barb-does the 8 pin score? If not, it could be the coil above the pins (under the hood). I would say it's unlikely that it's a RO sw. Make sure all the contacts under the hood are nice and clean, too. 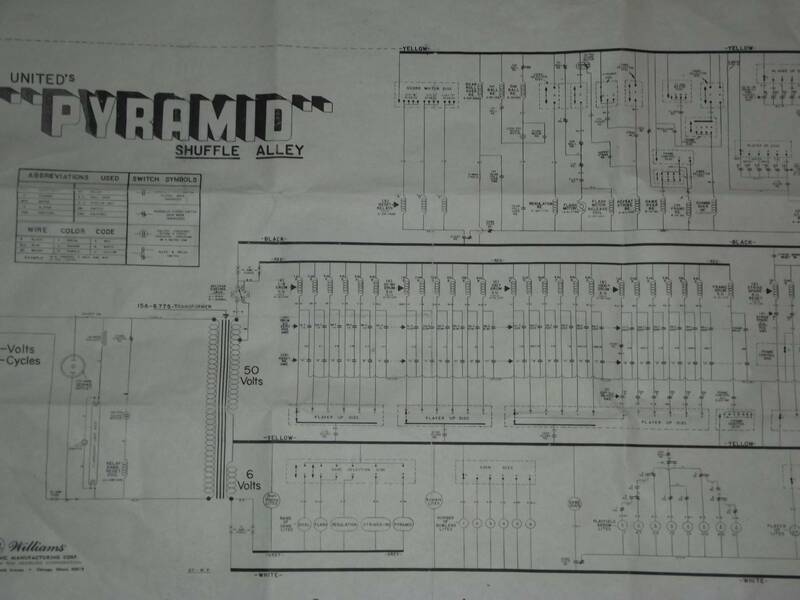 Here's a RO sw. diagram that shows pin combos-not your machine, but it's similar. PS-why don't you delete those SS posts so they don't distract. I have a bad back so my brother cleaned/adjusted 3 of the roll-over switches he felt may be at fault. He actually took them down and worked on them and re-installed them. I will have him read this thread and have him clean/adjust the ones mentioned above and I will take care of the switches above the pins and get back to you all. I already physically and electrically swapped the 8 & 9 pin retract coils (above the pins themselves) and no change, still the 9 pops up. And Yes, it does score. It trips the relay for the 9 pin on the long, vertical relay bank mounted on the door. I then hit the rear-rollover relay twice, once for each shot (as if 2 gutter "balls" were thrown) and it did indeed score just one point. 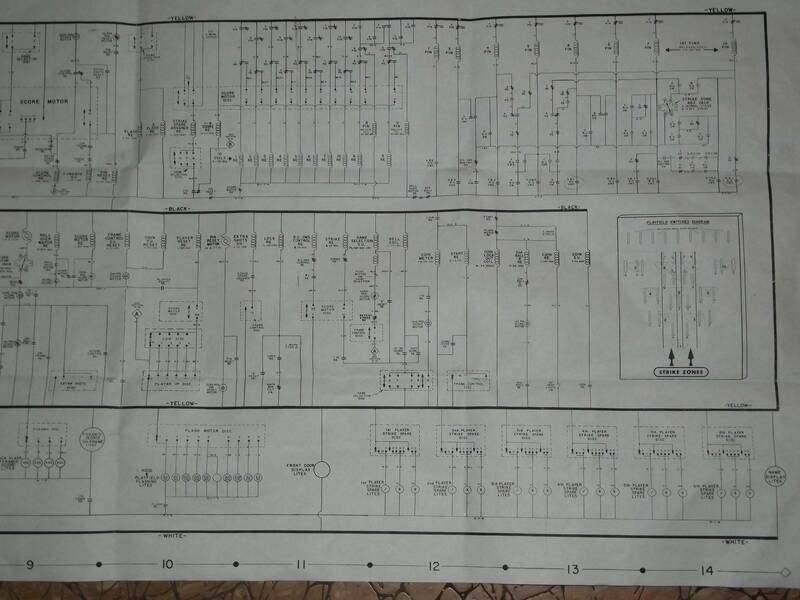 Can anyone tell by the schematic exactly what directly sends power to the 9 pin trip relay? It seems to me that the 8 pin is sort of a mirror of the 9 pin, electrically speaking. Can anyone think of a way for me to trip ONLY the 8 pin? I tried laying the puck over different roll-over switches and starting a new frame but could not get just the 8 pin to trip (the 9 pin of course trips anyway). I think if can get the 8 pin to trip by itself it might go a long way to figuring out why the 9 pin trips...? P.S. Don't want to appear ignorant, but what does SS mean? SS doesn't ring a bell. Where do you see that? Sevenrites' posts above about his SS machine. Any rate, my feeling is that it's the coil above the pin. my feeling is that it's the coil above the pin. Yeah, could be that the 9 pin is barely latching, and releases right after complete reset..
10 to 1, it's under the pin hood. Has to be.. The coil is definitely energized to pop the 9 pin up. Not a mechanical problem. Can't even bring the 9 down by hand as the relay won't allow it to stay down. Thank you all! The problem was one of the switches was in constant contact just above the three pin! Thank you! Thank you! Thank you! Please look for a new thread I will start soon dealing with how my player change of the same machine sometimes goes past of the number of players playing, and can randomly go backwards. YAY! Please check as resolved. I have been restoring a puck alley. It's been a long grind, but I've made it to a functioning CPU (System 11B) The three LEDs on the board are operating properly. As I work my way through the system check, I get to level "3" - the switch check. I get a blinking 4, 12, 20, 28, 36, 44, 52, and 60 in the frame box w/sound. These rollovers are all in one matrix row - #4. I have checked for shorts. All points have gap. Solder joints look good. Pressing on the rollover wires does not activate them (remove them from the blinking sequence) Numbers 44, 52 and 60 are listed as "Not Used" in the operator's Manual; don't know why they even show up. I'm stumped at the moment. retirednow , you'll get better help on one of the Electronic game forums. This is electromechanical.